The Nongame and Endangered Wildlife Program is supported by a variety of funding sources. Fishing and hunting license fees may not be used for this work, so the program relies on a combination of private donations, a small state-matching grant, federal funds, and moose plate dollars. Donations - Each year, the Nongame Program must raise $50,000 through private contributions to meet a matching grant from the state. That means your contributions are matched dollar for dollar! Every year, more than one thousand generous donors give to the Nongame Program. Federal funds called State Wildlife Grants also provide essential funding for the Nongame Program. By providing federal grant funds for the development and implementation of programs that benefit fish and wildlife and their habitats, State Wildlife Grants have transformed wildlife conservation in New Hampshire and around the country. State Wildlife Grants provide the most substantial funding source for the conservation of wildlife species that are not hunted or fished. These important grants provide nearly two-thirds of the Nongame Program's funding. State Wildlife Grants have been the catalyst for the comprehensive NH Wildlife Action Plan strategies. 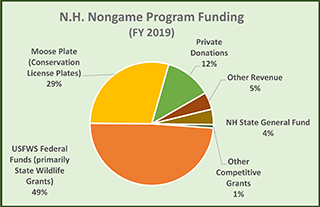 Moose license plate funds benefit the NH Fish and Game Department’s Nongame and Endangered Wildlife Program in their work to protect and restore threatened and endangered wildlife and to keep common species common. By supporting projects such as restoring terns on the Isles of Shoals and bringing Karner blue butterflies back to the Concord Pine Barrens, Moose Plate dollars help endangered and threatened wildlife in New Hampshire. As you can see, the Moose Plate Program provides 25% of the Nongame Program's funding.